In a sea of mass-produced, natural ingredient-based skincare products, British brand Lush stands out. For the simple reason that each bottle, tub, or tube comes with a sticker that tells you who made it, and when. Like how the tub of Salted Coconut Hand Scrub delivered to me was made by Vendula, a big-haired blonde lady (I know, because a cartoon rendering of her features is on the label) on January 20 this year. This personal, handmade touch just makes the product that little bit more special. It also helps that Lush has always been known for its “fresh handmade cosmetics” with a relatively short shelf-life; giving me the idea that real people, instead of cold hard machines, are stirring the formulas in vats. The Salted Coconut Hand Scrub is blended with fine sea salt, glycerine, fresh lemon infusion, organic silken tofu (!! ), argan oil, cupuacu butter, extra virgin coconut oil, neroli oil. While the grains of salt gently exfoliated my skin, the oils thoroughly moisturised it too. 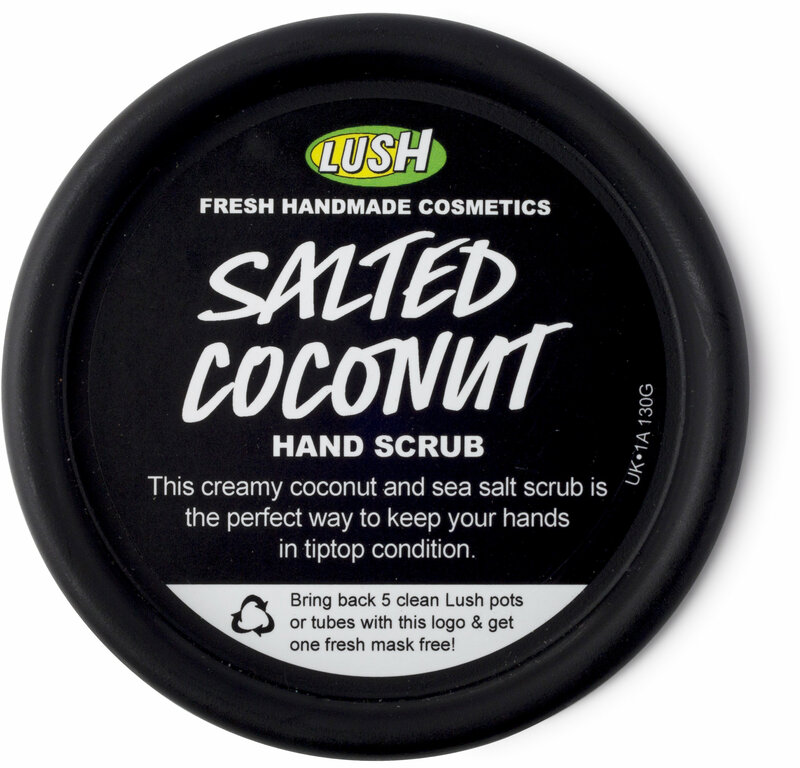 The scrub left my hands feeling soft, smooth and moisturised; and smelling deliciously like coconut. Perfect as a pre- DIY manicure treatment. If the skin elsewhere on your body is feeling dehydrated, you might want to consider using this as a body scrub as well. The Softy Foot Lotion (also made by Ms Vendula, on Jan 22 2016) is made with fair trade organic cocoa butter, fair trade almond oil, marshmallow root decoction, glycerin, cupuacu butter, bergamot oil, lavender oil, and sandalwood oil. The Softy moisturiser smells amazingly calming, feels lightweight and hydrates the skin well. I use this all over, not just on my feet. I expected the pink Strawberry Shaving Soap (made by Jeff on January 15 2016) to smell like strawberries, but its scent reminds me of an old-fashioned shaving soap…and something else that I cannot quite put my finger on. Well, a small trade-off for freshly handmade cosmetics. Smells aside, this creamy, fluffy, mousse-y shaving soap does the job well. It gives the skin enough slickness for a close shave, while moisturising it at the same time to reduce skin sensitivity. Made to be used everywhere that needs shaving. Contains rapeseed oil, coconut oil, organic rose hip oil, fair trade organic cocoa butter, fresh strawberries, fresh organic free range egg whites, organic maple sugar, fair trade vanilla absolute, sweet wild orange oil, and rose absolute. This lightweight Enchanted Eye Cream (made by Nathan on February 16 2016) is easily absorbed by the delicate skin around the eyes. Contains lavender honey water (which makes it smell great), organic cold pressed almond oil, glycerine, and organic jojoba oil. Good for layering underneath undereye concealers that have a drier texture.